We will start this competition on 2nd of November at 7-30 prompt and we should be able to play 6 games that will get us down to the semi-final. The times shown are approximate and everyone should get themselves here in good time. ‘B’ section sides will get 2 dolls per leg when playing ‘A’ section sides. Please pay attention to the time you are on as it may not be in draw order, this is to avoid a team playing 2 games before others have played one. This draw was made by B.Clapton & R.Holmes (wont be asking them again). Good luck to all. Penlons’ lowest total so far (27) was just enough to overcome Brown Owls 4-2 with leg scores of 9-8, 11-9, 7-9. For Penlon D.Bellcourt 8 & P.Stone 7. In reply for The Owls B.Robbins 9 & P.Brown hit 7. I.Brown needing 1 to draw the 1st leg managed to blob – t*****. Answers on a postcard. Ab. Utd. ‘A’ dropped points for the first time after a 3-3 draw against Spread eagle ‘B’. The leg scores were 13-15, 19-14, 15-15. For Utd. ‘A’ D.Dix included a 6 in his 15, B.Parker 9, D.Davies & K.Fisher 8 each & T.Ward 7. For Spread ‘B’ L.Clapton hit 14 consecutive doll’s in his 6-6-2. B.Stowell 10, A.Bell & N Weston 8 each. A cracking game from the league’s top two teams. Ab.Legion beat Ab. Utd. ‘C’ 4-2 with leg scores of 10-8, 13-7, 10-11. For The Legion C.Brind recorded his 4th score of 9 on the trot. D.Sapey 8, P.Ealey & N.Hazell 6 each. In reply for Utd. ‘C’ M.James & T.Harrhy 8 each and C.Keeley 6. Spread Eagle ‘A’ beat Ab.Utd. ‘B’ 5-1 with leg scores of 14-11, 14-12, 12-12. For The Spread D.Mott 14, S.Humphries 9, J.Bowler 8 & S.Kinnaird 6. For Utd. ‘B’ Roy ‘The Pope’ Taylor 11, S.Martin 9 & K.Souch hit 7. The Heathens struggled (again) to a 4-2 win over Ab. Con. Club with leg scores of 9-14, 16-9,16-9. For The Heathens D.Butler 11, T.Downes 10, J.Ellaway 8 & A.Woolloff 7. In reply for Con. Club Brian ‘Cracker’ Clapton top scored with 10 dolls (no this is not a typing error). A.Wood (making his debut) & P.Barrett each scored 8 dolls. p.s. We should be able to get the 6 games played tonight that will take us down to the semi-final Don’t forget the 3 stick rule. Good luck to all. We now have the photos taken by Ellen Downes (Plum Pudding Terry Downes’ daughter) uploaded for your enjoyment along with the videos of the matches on Aunt Sally TV! Geoff Lee, Scott Humphries, Becky Lyford & Harry(!) for doorman duties. 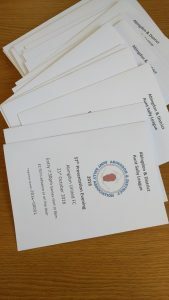 Programmes were prepared and printed by Paul Stone. AllSports Trophies for the trophies and donated raffle prize. 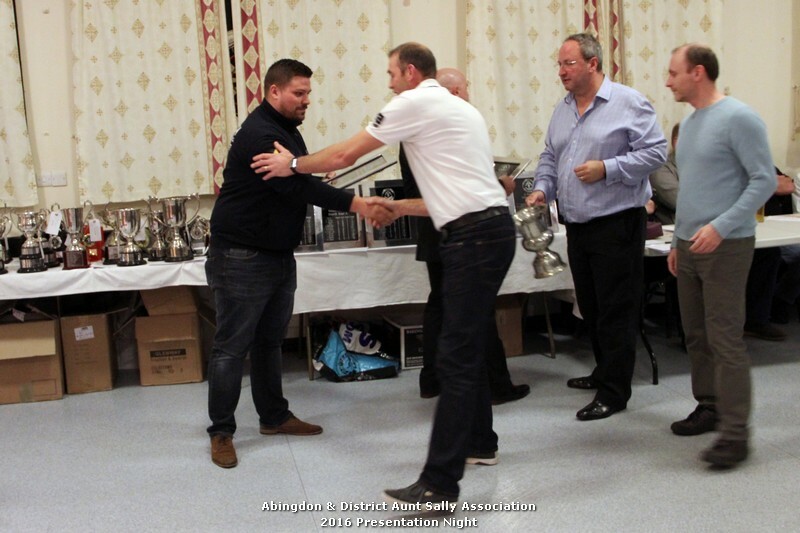 Trophy handout by our sponsor Matthew Tutty, Plumbing and Heating. Many thanks to all who helped, attended, bought raffle tickets and made the night what it was. Ab. Utd. ‘C’ beat Ab. Con Club 4-2 with leg scores of 7-9, 10-8, 14-11. For Utd. ‘C’ C.Keeley, T.Cartlidge & Jono Warrell 7 each and M.Fenton hit six. For Con. Club P.Barrett 11 & B.Clapton 8. Ab. Utd. ‘B’ beat Penlon 4-2 with leg scores of 11-10, 11-13, 16-14. For Utd. ‘B’ R.Taylor & D.Harris 9 each, S.Martin 8, N.Green & D.Taylor 6 each. In reply for Penlon T.Lach & P.Wright 9 each, D.Bellcourt 8 and ‘newly wed’ P.Stone hit 6 – nice to see you back on your feet Paul. Ab. Legion beat Spread Eagle ‘A’ 4-2 with leg scores of 15-10, 12-13, 11-10. For The Legion D.Sapey 10, C.Brind 9, N.Hazell 8 & P,Ealey 6. In reply for The Spread D.Mott 12, S.Humphries & J.Bowler each hit 8 dolls. Spread Eagle ‘B’ beat Brown Owls 6-0 with leg scores of 14-6, 15-4 (yes four), 11-5. For Spread ‘B’ A.Bell & L.Clapton 10 each, B.Stowell 8& S.Enock hit 7. For The Owls nobody scored very many and everyone scored very few, in fact S.Bonthron & D.Hathaway throwing more like ‘Chang and Eng’ (check them out) managed just 1 doll each. Ab. Utd. ‘A’ again hit over 50 dolls in beating The Heathens who couldn’t record a point, or C.R.A.P. for short. The leg scores were 13-10, 18-15, 20-12. For Utd. ‘A’ D.Dix included a slightly dodgy 6 in his 13, D.Davies 11, T,Ward 10, B.Parker 9 & K.Fisher 8. For The Heathens D.Butler included a 6 in his 12, P.Longford 8 & T.Downes 7. Spread Eagle ‘B’ and Ab. Utd. ‘B’ kicked of f the new season and in a close game Spread ‘B’ ran out 5-1 winners with leg scores of 15-14, 14-13, 14-14. For Spread ‘B’ B.Stowell 11, L.Clapton 10, R.Nicholls & new signing A.Bell 8 each & S.Enock 6. In reply for Utd. ‘B’ S.Martin 12, K.Souch 11, D.Harris 7 & N.Green 6. Penlon beat promoted Ab. Legion 4-2 with leg scores of 10-14, 15-7, 14-12. For Penlon close season signing P.Wright top scored with 10. T.Lach & E.Jeffries 8 each, P.Stone 7 & D.Bellcourt hit 6. For The Legion C.Brind & D.Sapey 9 each & P.Ealey 7. Ab. Utd. ‘A’ beat Ab. Con. Club 6-0 with leg scores of 16-12, 16-10, 20-9. For Utd ‘A’ D.Dix hit a bakers dozen (that’s 13 for the uneducated), K.Fisher & B.Parker 11 each, D.Davies 9 & T.Ward 8. In reply for Con. Club P.Barrett 11, B.Clapton & M.Neal 7 each. ‘Hip-op’ king R.North managed just 1 doll. The Heathens struggled to a 4-2 win over ‘new boys’ Brown Owls with leg scores of 10-6, 9-10, 11-6. For The Heathens P.Longford 7, D.Holmes, J.Ellaway & T.Downes each scored 6. For Brown Owls P.Brown included a blob and a 6 in his 8 dolls. C.Chung throwing like a left handed policeman hit 1 doll. Brown Owls certainly made a ‘twit-or-two’ out of The Heathens. Spread Eagle ‘A’ beat Ab. Utd. ‘C’ 5-1 with leg scores of 14-5, 12-12, 17-10. For The Spread D.Mott 12, J.Bowler 10, J.Gapper 8, B.Newman 7 & A.Humphries 6. For Utd ‘C’ the returning C.Keeley top scored with 9 dolls and Jono Warrell hit 7.
p.s. Just like to take this opportunity to welcome all new players (except P.Brown obviously) to the league and hope you enjoy your season. Programmes are now in sale for the Presentation Night on Friday 21st October. Get yours from Paul Stone at the Winter League Wednesdays at Abingdon United FC or email. Presentation Night includes semis and finals of both the Pairs and Singles competitions. Winter League starts this Wednesday at Abingdon United FC. Fixture lists have been with your Captains for a few weeks but here’s your chance to print your own!